57 minutes. Two films with subtitles (Indonesian and German). Ages 7+. A few films depict scenes of emotional difficulty, with happy endings. Over the past nine years, the Children’s Film Festival Seattle has become the largest, most respected film festival on the West Coast dedicated to young people and their families. 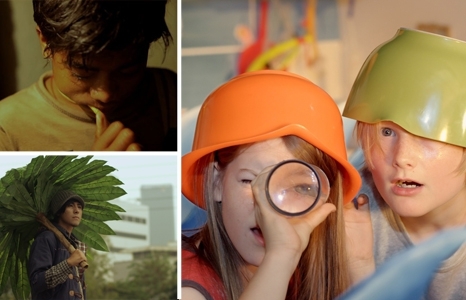 We present a showcase of the most innovative, inspiring and fun short films from this year’s festival. In these films, kids face off against the odds by making decisions that are sometimes wise, sometimes brash, sometimes brave but always full of imagination. Bring your kids to see the world and feed their minds with this international collection celebrating the indomitable spirit of the child. While You Weren’t Looking (Jeremy Mackie, USA, 11 min). Hop behind a shopping cart to see how fast it can fly. Winner of the CFFS Seattle Children's Hospital Jury Prize for Best Live Action Film. Watch the trailer. I Spy with My Little Eye (Alexandra Nebel, Germany 10 min). Make your own adventures with two friends who find themselves house-bound on a beautiful summer day. AMAR (all great achievements require time) (Andrew Hinton, India, 9 min). Meet a boy who keeps moving, from sun up to sundown, to achieve his goals. Winner of the CFFS Festival Children's Jury 2nd Prize for Best Animated Short. I'm Going to Mum's (Lauren Jackson, New Zealand, 13 minutes) Find out how a boy gets his warring mom and dad to finally listen to him. Winner of the CFFS Children's Jury Prize for Best Live Action Short. The Raining Tree (Andra Fembriarto, Indonesia, 14 min). Discover how magic can pour down when you least expect it. Watch the trailer. Sponsored by the Sidney Stern Memorial Trust. Special thanks to Elizabeth Shepherd, Youth Programs Director at Northwest Film Forum and Director of the Seattle Children’s Film Festival.